Today I found out the actor who played “Scotty” on Star Trek, James Doohan, was shot six times storming Juno beach on D-Day. Doohan, a Canadian, after leading his men through a mine field on Juno beach and personally taking out two German snipers in the process, eventually took four rounds in one of his legs; one in his hand, which ultimately resulted in him losing his middle finger; and one in the chest. The shot to the chest likely would have been fatal except that he had a silver cigarette case there, given to him by his brother, which deflected the bullet. He would later give up smoking, but at least he could say that being a smoker actually saved his life. Ironically, the shots he took were not fired by the enemy, but rather by an overzealous Canadian gunman. After his unit was secured in their position for the night, Doohan was crossing between command posts, when a Canadian gunman spotted him and opened fire. Doohan originally joined the Canadian Forces at the age of 19, eventually being commissioned a Lieutenant in the Royal Canadian Artillery. D-Day was the first and last action he saw in the war. After recovering from his injuries, he became a pilot in the Canadian Air Force, but never saw action. Despite not ever flying in combat, he was once called “the craziest pilot in the Canadian Air Force” when he flew a plane through two telegraph poles after “slaloming” down a mountainside, just to prove it could be done. This act was not looked upon highly by his superiors, but earned him a reputation among the pilots of the Canadian Air Force. Both the Klingon language and the Vulcan language were initially very crudely developed by Doohan. Later, these languages were expanded and refined by professional linguists, primarily by Marc Okrand. While great pains were taken in Star Trek to conceal the fact the Doohan was missing a middle finger, there are several episodes where this can be observed. These include: Cat’s Paw; Day of the Dove; and The Lights of Zetar. This can also be observed in a scene in Star Trek III: The Search for Spock and In Star Trek V: The Final Frontier. In the former, it can be observed when he hands McCoy parts for the Transwarp Drive and in the latter when he’s holding a plastic bag dinner which was given to him by Lt. Uhura. Doohan not only played the character Scotty in Star Trek, but also did the voice for many different parts including: The M-5 from The Ultimate Computer and Sargon from Return to Tomorrow, among many others. Before landing the role as Scotty, Doohan did over 4000 radio shows and 400 TV shows in Canada and was particularly noted for his great versatility in voice acting. Shortly before his death, Doohan was suffering from Parkinson’s disease, diabetes, lung fibrosis, Alzheimer’s, and, eventually, pneumonia. His official cause of death was listed as pneumonia and Alzheimer’s. I’m glad he lived, he seemed like a guy I would have liked to have met. I met him twice. Once at a media store. He signed a poster and gave me a wet kiss on the lips which was not welcome nor expected. The second time 20 years later at a Startrek convention in Tampa FLORIDA. I watched him signing my daughter’s photo of him and I prewarned her of his amorous kisses. She kept a distance. He seemed to like kissing cute girls when they least expected it. He seemed inebriated but I think that was an act. Ahhh, gross! I’m not shocked, though. This is coming from a middle-aged guy who concluded that he would be happy marrying a 17-year-old on the basis of a kiss. Somehow, I doubt you’re that cute. I met him at the Lord Baltimore hotel at a ST convention. We were in the bar and he walk3ed through the front door and came in the bar after we yelled at him. He talked with me for 20 minutes as I had ben to Nova Scotia and the Bay of Fundy as a kid. A REALLY nice man. He declined the drink we offered he said it was “too early” and signed our stuff after the convention. I’d rather not watch “Star Trek V – Never Let Shatner Direct” again just to see Doohan’s missing finger, especially with how badly Scotty was treated in the movie. Scotty was an extremely important role model for engineering students since the 1970s and Doohan cherished that role, speaking at many colleges. He was given honorary engineering degrees because of all of the students he inspired. Doohan’s last child was born when he was about 80, over 40 years after the birth of his first child. 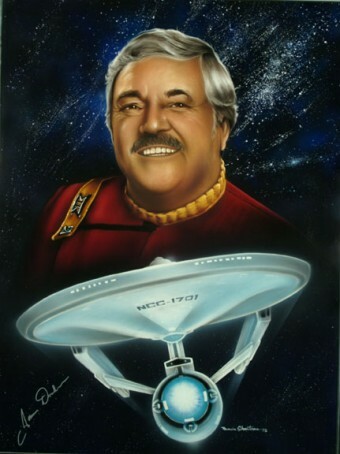 I met Jimmy Doohan when he lectured at Embry-Riddle Aeronautic University, not that long after the failure of Star Trek V-the Search for More Money. He was very funny and talked about his experiences in WWII and lovingly talked of his time as a pilot. One of his stories included low altitude maneuvers (like less than 20′ off the deck) around Stonehenge. He couldn’t stand his fellow Canadian Bill Shatner and went on and on about how bad ST5 was to shoot. I taught karate in New Orleans and also managed the Crescent City Health Club in 1966 when Star Trek first aired. It was unusual for so many of the members to stop the workout and watch a show with such interest. I followed William Shatner’s success over the years and enjoyed all the cast members of the show. The many shows that were spin offs of the series proves that the experts that took the show off the air after three years did not have their fingers on the pulse of the audience. They were wrong the audience was right. I have enjoyed Shatner’s writings and his other shows that he has appeared in. It will be a long time before we have another like him in the entertainment world. He is 86 and I am 80. I hope to be as active as he when I reach 86.